Join Us Where It All Started. In 1962, we began offering guided whitewater rafting tours in Ohiopyle. Now more than 50 years later and over a million river miles paddled, we are still doing it because being on the river is unlike any other outdoor experience. Let us share our experiences with you on the Yough River and Cheat Canyon. For a serene and calm float, book a trip with us on the Middle Yough. Explore the majesty of the Youghiogheny River valley on this trip as you enjoy the unending beauty and wildlife of the Laurel Highlands with your family or group. 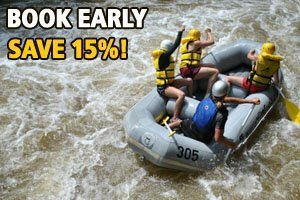 If you’re looking for an extreme whitewater experience, then don’t miss a chance to run the Upper Yough. This river is tight and falling down, with one section dropping over 115 feet per mile. Only the experienced rafter should challenge this black diamond of river runs. The largest uncontrolled watershed in the East feeds the Cheat Canyon, making this section of the Cheat River arguably the most demanding river run on the East Coast. You will travel from the civilized world to a land of man versus nature on this 11-mile stretch of big, pounding water.